Whereas a lot of readers are anxious for a 4G report, I’ll start with a summary (but please bear in mind that testing and comparing radars is tricky business). In my view, 4G truly is a significant upgrade from the original BR24 and its 3G successor. It does have more power, better range, and better horizontal resolution. Higher possible automated rotation speed will no doubt improve close-in tracking of fast targets (I only got one lobster boat to test that theory on), and the new dual range feature — if you have an MFD that supports it — is the absolute bomb. But can it faithfully produce the range of a 4kw radome or the beam width of a 3.5-foot open array? Is it true that “Broadband 4G Radar signals the death of pulse” radar? Sorry, but that kind of talk is premature, I think. Above is a look at 4G set to 12 mile range with Gizmo off Camden and headed South toward Owl’s Head. You can also see the controls available to get the most out of the “B” side of the 4G (it really is like having two 4G radars at work). I have Target boost on “high”, Target expansion enabled, and the threshold for weak signals turned down fairly low, all of which should help with distant targets, I think. And there are more distant targets than shown, even if they are radar-absorbing evergreen foliage on sloping terrain. The other radars, even the 2kW Furuno, showed more of the distant topography, which I’ll illustrate in a coming entry. But the screen above better illustrates how I’ll likely use 4G for coastal cruising, and if you appreciate overlay and maybe even 3D, it’s extraordinary. Radar overlay imagery is always a bit “dumbed down” to make it show decently on a chart, but those are two completely independent overlays, and all the tweaks seen in the menu further above can be applied to each. What’s also telling on that screen is that some targets are showing up behind Gizmo, despite the fact that the 4G is mounted on the front of the flying bridge with quite a lot of obstructions behind it. Super low power Broadband is sensitive to onboard obstructions, but the BR24 that used to run from the same spot never saw targets much abaft the beam. Definite power improvement. (Yes, I ought to put the 4G up on the mast to more fairly compare long range performance, but it’s crowded up there, the lower mount does help with extreme near range performance, and I’d be a dite nervous to point a magnetron beam so directly at, and close to, my body.)…. Above is another useful cruising mode, with independent close range overlay on the left and 6 mile straight radar windowed on the right. Note how the offset long range is actually seeing hills and islands at about 8 miles. I believe that’s better than previous Broadbands, somewhat comparable to the good HD radomes, and that you would make out larger vessels at that range, especially in more open waters. But note also how 4G’s “beam sharpening” is separating the ledge and buoy pair about a mile ahead. That’s very hard to do with the 5 degree beam width typical of an 18-inch radome. Now an important caveat. Note how the screen below, taken nearly at the same time as the one above, does not seem to have the beam sharpening in action (and does not identify A and B radars). That’s because it was taken on the Simrad NSS8 which is also onboard Gizmo these days. It’s a fine MFD, and better than when I first tried NSS in Spain, but it does not support the 4G dual range feature. It does show beam sharpening, which is a bit confusing on Simrad’s BR comparison table, but I’d have to reduce the range on the right window for the horizontal detail to show up on the left window. (This caveat also applies to the Lowrance version of 4G.) Would a Simrad NSE with its apparently more powerful processor (and its wonderful quick mode buttons) be nice with touchscreen added? Heck, yes! 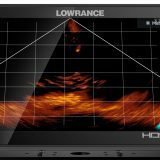 Next story Lowrance HDS Gen2, with StructureMap! Previous story Hello Nobeltec TimeZero Odyssey, goodbye VNS? I meant to add the observation that Beam Sharpening — the 4G’s unique ability to simulate the narrower beam of a longer antenna — seems a little “jaggedy” to me. It really does work, as you can see on the next to last screen, but sometimes it appears to break up objects that aren’t separate, like a few of those harbor floats on the very first screen. When I get back to cruising I may end up putting Target Separation to medium or low on one of the two internal radars to get a smoother presentation, particularly for overlay. But, sadly, that’s not going to happen until April or May. I started stripping electronics off Gizmo on Monday, convinced that I’d turn out a fool if I passed up a warm, sunny afternoon at this late date. 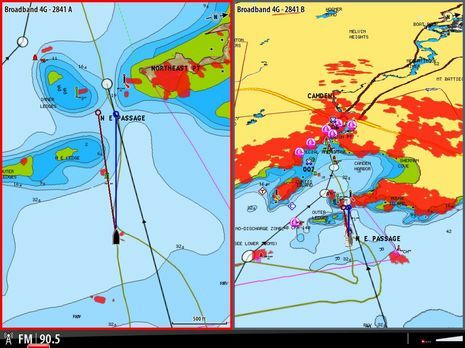 Great info, I’ve been considering a change to simrad and 4g from garmin, and this helps a lot. Does the NSE have an FM radio controller in it? The NSE12 on Gizmo’s bridge is networked to 4G radar(s), Structure Scan, the NSS8 MFD, Sonic Hub, AP28 autopilot, and a mess of NMEA 2000 sensors, and it still seems as fast as it was standing nearly alone. NSE12,NSO, BR 24 radar, LSS and LBS in the network. Actsense, RS82, WR20, Sonic Hub, Course computer, GPS, OP40 controller (which also works great on the NSE), Compass on Simnet. And still working very Fast. Ben, I saw that you also have found the guard zone on the radar part. Is it just me, or is the product life-cycle of Navico/Simrad radars extremely short? It seems like a new generation gets announced just after the backorder for the last generation finally gets cleared. I find it hard to believe that these improvements were just recently invented…to me, it smacks of planned obsolescence. It seems to be more of a Navico thing than an industry-wide thing. Karl, planned obsolescence “is a policy of deliberately planning or designing a product with a limited useful life, so it will become obsolete or nonfunctional after a certain period of time” according to Wikipedia. That’s certainly not what’s happening with Broadband Radar. The older versions still work at least as well as they did when purchased; in fact, there have been improvements made in software. It strikes me that many truly new technologies change a lot in their early years, which can be hard on consumers and even on the companies that develop and market them. I agree. I would say its forced obsolescence because its so hard to keep a consumer product out there for a long time simply because we consumers are quick to jump to the latest, greatest. Having once been a manufacturer, I can say there is nothing wrong with selling a product forever. The ROI is fantastic. If only the customers would keep buying the same old stuff! The consumer marine market is a small niche, and every sale really counts. 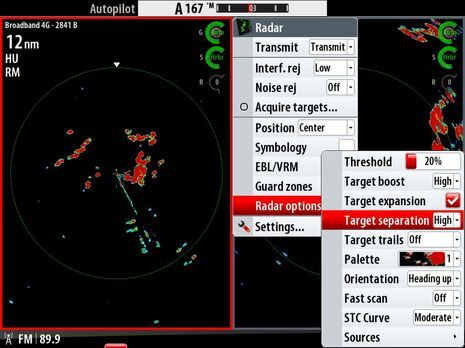 I feel Simrad was forced to release new radar products rapidly by us, the consumers. As noted here in Panbo, everyone loved the new Simrad radar, and nonetheless the product had to overcome our comfort level with traditional radars. 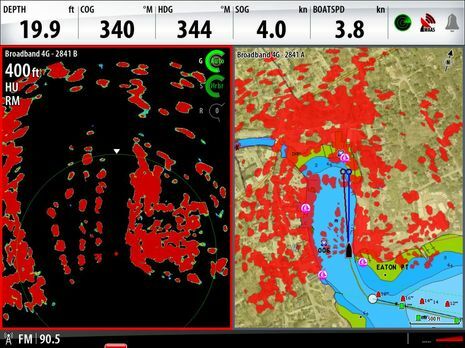 While some objections could be addressed without a new product release, ultimately Simrad had to offer the 3S and 4S, for example, simply to move us consumers from “window shopping” to buying. The rapid cycling of products is at times confusing and frustrating. It is forced evolution, and we the consumers are the drivers. I, like most of us, think the latest offerings are each more fantastic than the last. Nonetheless, when I upgraded my instruments to N2K, I was still happy even knowing that if I only waited a few more weeks….The same applies when it comes time for a new radar. So this begs the question. Is there an open array version of broadband in the works? 3G is also absolutly still for sale. 3G and 4G are sold side by side at different feature and price points. I have no idea, Greg. But I recall hearing when BR first came out — after some five years of development — that a key to making it possible at a reasonable price was that a certain exotic component had come way down in cost in a certain power range. And that’s why the BR24 had the power it did, and why at that point they couldn’t build a more powerful model at a reasonable price. In other words, factors way outside marine electronics may be driving what’s possible to a certain degree. 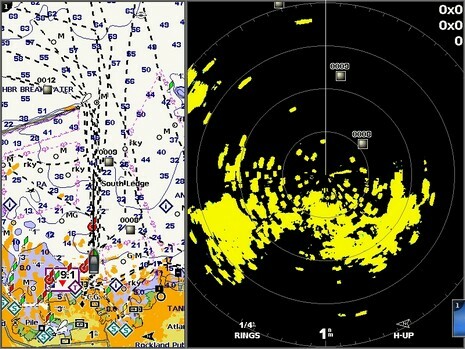 I think that it’s interesting to note that Garmin already builds solid state aviation radar and that FLIR (Raymarine) bought a surveillance company specialized in solid-state radar (discussed in the first 4G radar entry: http://goo.gl/EJOJX ). And who knows what Furuno’s crack radar engineers are up to? I wonder if any of the Lowrance HDS generation 2 units will have the capability of the split screen/two ranges, and all of the other features of the best Simrad multifunction units? The point being that this may be more of a price point for the average recreational boater. The other question is what size ship will show up at 12 miles?–since that is about as far as I normally look for larger or fast moving vessels. If the 4 G gives good vessel detection at 6 miles and the close in resolution, it certainly appears to be a winner. solid state radar is not what the broadband radar is. it uses solid state transmission but is not the same as Kelvin Hughes or aircraft solid state radar. pulse Radar technology is still advancing and some are replacing the magnetron with a solid state transmitter like KH. As for the safety of a Broadband radar ask your dealer to put it by his family jewels as they say it is like a cell phone. i asked the local dealer who when i asked said yes then backed out when i said hold it there for half an hour like your cell phone. it is good to see new technology but i hate the gimmick of Broadband,3G and 4G which is to make people think it is the latest and greatest……. i feel it is new but still has a way to catch up to Furuno,Raymarine,koden and JRC. 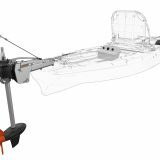 Shame Simrad and the others stopped using Koden/Anritzu top ends as they seem to preform well compared to the BR24 that replaced them. i have seen some great advances in technology while being a marine service tech and i hate more than anything gimmicks that can cause people to buy equipment that is not up to the job. can you please do some testing in rain and bad seas as this is when Radar is most required. NOT WHEN DOCKING IN THE MARINER like the simrad ad’s think is important. One of the critiques of broadband radar is that it can be “blacked out” by nearby pulse radars. One person claimed that in a busy harbor, with lots of radar going, you would be essentially blind. Oy. So what is it about Broadband Radar that seems to bring out the grumpiness in a few people? And another question: how is it that a radar with a solid state transmitter is not a solid state radar? I read your column for a long time here in holland. I want to use a MFD from for example Raymarine or Simrad as a monitor for my laptop below, so I can use other programs on my MFD. Nobody could tell me if this is possible. 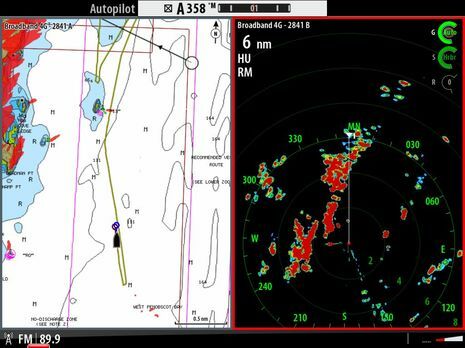 In one of your articles you write that an simrad NSE 12 can do this, is this right. And can you tell me what I need. Greg, I never saw a “black out” but the early BR24 could definitely experience spoky interference from nearby magnetrons. They fixed that pretty well with multiple levels of Interference Rejection. I rarely saw it on the original BR24 last season even though I rarely use more than “Low” IR because it does seem to filter away some target detail. Magnetron radars on your own boat in very close proximity to a BR is another story. You can see from the top photo how mine are set up. Proximity could be worse but I could still mess up the BR24 some with any of the magnetrons. I think Navico cautions against running BR and magnetron on the same boat, but I think it’s possible with care. Turning up IR on the BR and keeping the radars at distinctly different ranges worked OK for me. I don’t have much time with 4G yet, but it seems like the IR is even better. And I was surprised to see the 4G seem to cause a lot of spoking on the just-turned-on Furuno UHD, but the Furuno adjusted itself for the situation fairly quickly. I’m a relatively new boater, just finished my first season on a 1998 Rinker FV 266 on Lake Michigan. 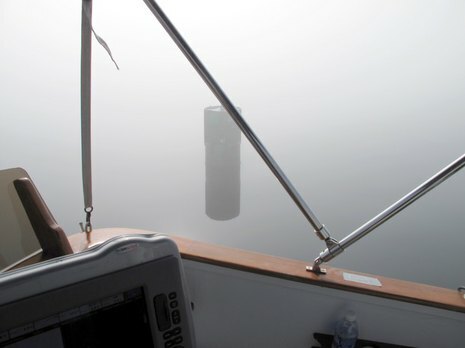 I already have a standalone Garmin 441s GPS installed, but would like to add Radar now that I’ve seen how quickly fog can roll up on me out there. How is the Furuno 1623? Or would you recommend looking into something else for my navigation needs? Has anyone made a dome that plugs into an ipad/android tablet yet? 🙂 Any advice appreciated. Of course, budget is a consideration. I had a conflict on Wednesday — when will 7 Seas have your Radar Webinar up? Michael, I’ve asked for specifics but I think the SSU recording will go up next week and be available for at least a month. I thought the webinar went pretty well, and I remain impressed with how well they’re hosted. SSU uses Adobe Connect Pro, which is a powerful tool, and the administrators are adept at it and always present during the sessions. Altogether it’s a neat system and a testament to the modern internet. Here I was at my desk in Maine delivering an illustrated lecture and verbally answering chat questions from students all over the place while the chief admin, Thomas Theisen, was online from his catamaran somewhere in the Dominican Republic with his wife Barb cohosting Wednesday night’s webinars from New Mexico (I think). I’ll post more info on the radar recording when I get it. A. D., I don’t think I wrote that a Simrad NSE can do this, and I doubt it can very well. It may be possible to convert the VGA, DVI, or HDMI output of the laptop to video but I don’t think the results will look good. The only MFD I know of that’s designed for this purpose is the Garmin 7015/7215, which has a VGA input. I believe it fills the whole 15-inch screen with the PC’s output and would be great for what you want to do. It is expensive, but maybe not compared to sunlight-viewable, waterproof marine monitors. Nick, I used a 1623 years ago and it is “a lot of bang for the buck” as they say. Which is probably why it’s still around, and now about the only standalone radar for about $1,300 complete. But it’s not nearly in the same class as Furuno’s only slightly larger UHD19 or the other radars I’ve been testing the last few years. From the 1623 I think the next steps up the price/performance curve are combinations like the Garmin 700 series and their 18-inch radome, or a Lowrance HDS7 and a 3G radome, or a Raymarine E7 and 18″ Digital. All good systems. No direct radar for pads yet, and none in sight I know of, but you can stream Ray e7 to iPad. I was planning on buying the NSS8 with the 3g radar because of the low power consumption. Now the 4g comes out and I’m not sure if it’s worth the extra bucks for some more range? What do you think? And what is the true working range of the 3 and 4g units? I’m told that “the recording itself will be available for viewing until April 1, but registration will close on Jan. 20.” And I think that the code “Gizmo” will still get Panbo readers the $10 discount. Will carbon spars and/or carbon fiber sails obstruct Broadband Radar on an aft pole? I got a call about this from a boatbuilder and it got me wondering. Simrad/B&G has told them that BR is sensitive to onboard obstructions, which I’ve observed myself (though less so with 4G). But Simrad tends to be (wisely) conservative with its recommendations, and I thought I recalled that some of the Volvo boats are using BR. Anyone have knowledge about this? In my experience BR isn’t that much different in terms of obstructions compared to normal radar when faced with a big obstruction like a close by mast. Neither seem to care about smaller ones such as rigging. Then again I only have experience with a limited number of normal radars and one BR(24). As to carbon versus alloy — both pulse and BR are transmitting at nominally the same frequencies (X band) and thus would have the same response to certain material types. In theory carbon is as good (or bad) at letting through X band transmissions as alloy. The only difference would be the density and orientation of the carbon which might have some influence on the reflectivity of the material (is it ‘shiny’ for the radar). My personal experience is that it alloy will reflect radar beams more, giving false echoes, whereas carbon will just cause a dead zone behind the obstruction. In our particular case we could not use an aft pole because this would be at around the same height as the (aluminium) park avenue boom, and thus we’d have a huge dead zone facing forwards over either SB or PS depending on which tack we would be sailing. Likewise, we also didn’t go for carbon based sails because all sail makers I spoke to said they would hinder radar. (Well, and the price didn’t help either.) Whether this is a real or just imagined issue I cannot tell. I guess that if you’re a pure racer your tradeoffs are a little different from cruising folk. Let’s hope Nick chimes in on the V70s. Cool boat with a concept familiar to me: water ballast and lifting keel. Electronics and communications programs have been developed by the experienced Lyman-Morse staff with lots of input from Stanley to meet his specific needs. The boat will be outfitted with a B&G Zues (sic) multifunction display at the nav station, a PC running MaxSea software with weather routing module, AIS displays on deck and at nav station, Simrad Sirius satellite weather system, full B&G instrument package, NKE autopilot with wireless Man Over Board remote to automatically head the boat up if one were to fall overboard. The Inmarsat fleet broadband will provide “high speed” communications link to Skype. I find that a bit of a weird combination. Sounds best-of-breed but I’d say Expedition fits the bill better here as that offers better integration with the Navico system — can even be used as a backup radar display if the Zeus is down (at a price). Is anyone chosing the BR4G for offshore use? The low power draw and short warm-up time are definite pluses, but I’ve read that earlier models were poor at detecting rain/squalls at distance. In this sense, how does the BR4G compare to a good conventional 24-mile 4KW radar? Is it somewhat useful or just not a contender? Thanks. 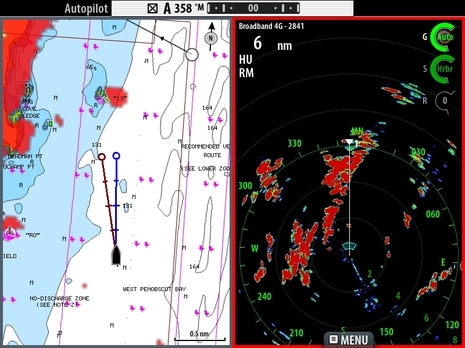 Also, is anyone aware of any software that uses Simrad’s SDK, which was touted to allow OEM and third party developers to use the BR4G as a black box radar for PC-based sofware without the need for a Simrad multifunction display? Apparently Rosepoint Navigation also programmed support for it in Coastal Explorer, but decided not to market it yet because the associated license fee is quite substantial. I’m beginning to wonder if two arrays is the answer… a BR3 for its power savings in watch mode AND an open array for more challenging situations. 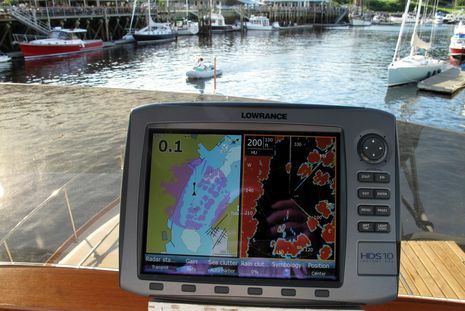 We have been using a Lowrance 3g all through Indonesia and Thailand, Malaysia. In practice it works very well. Well offshore when you are only worried about ships the warning zone works perfectly and sees a ship on the horizon. When dealing with the many small wooden fishing boats in Asia, gain has to be right up and the range set to about 1 mile or less and generally they show up. Its current draw is totally minimal and is very handy for entering anchorages at night for seeing anchoured boats and judging the distance to shore. At present I a considering carbon sails and am looking for answers on how much they effect this type of radar. Hey Ben! I’m a real novice when it comes to radar. I thought after reading your review of the 4G… it was a no brainer for me. However, my marine electronics installer (and fishing buddy) said to go with the 4kw. We sometimes get rain and fog at the same time and he said the 4kw would be much better in that situation. I am more concerned with collision avoidance at night or in fog. We fish the Gulf where we aren’t looking for clusters of birds with the radar. I also have my children on the boat some and would think the 4G is safer. My boat is a 26′ World Cat SF with a Simrad NSE. Any guidance would be very much appreciated. Fog shouldn’t be an issue for any of these radars but rain is tricky because sometimes you want to see it (to get around it) but usually you want to see through it. The 4G does both quite well. I didn’t get a screen shot for that entry linked to above but the 4G could easily filter that heavy downpour and still see solid targets. I’m curious about exactly what circumstances and ranges your installer thinks a 4kW is “much better” than 4G. Thanks Ben! He said he was concerned about the ability of the 4G to be able to “punch through” rain and fog when you have both at the same time. Your input has me leaning toward the 4G. I’m confused (probably because radar is new to me) regarding your caveat. 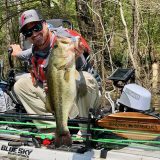 You said that Lowrance does not have dual scale mode? I checked and it does. Did I misunderstand you? 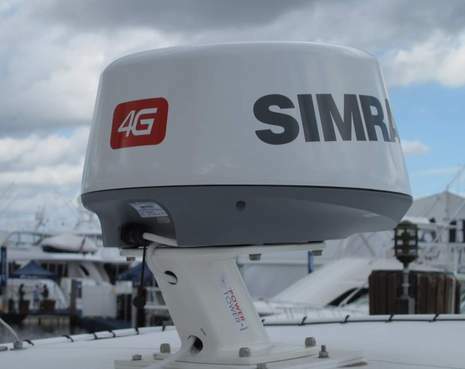 Back in 2011 when the 4G radar came out and I wrote this entry, I think only the Simrad NSE could take advantage of its ability to work at two independent ranges. I haven’t checked but it’s quite possible that newer Lowrance MFDs and maybe the new Simrad NSS evo2 can also do dual range now. There are several high-end radars that can be used in dual range, but to my knowledge the 4G and some Navico displays are the only combination that can display both ranges overlaid on charts as well. So I’m not sure what was meant where you saw “dual scale mode” but apparently no Lowrance MFD supports the dual range possible with a 4G radar. Wil this 4G radar work i.c.w. a Raymarine E-7 display? straight on ‘plug&play’? if no; is there an interface cable available? any Cons? Could not find a straight answer on this……dealers did not know. I already have the E-7, might add a radar system to is. will be mounted on 2m pole aft of cockpit, so no microwave radiation please for me………. Any more advice for a 20 knot sailboat? Sorry, Robert, that’s not possible and I don’t know why a dealer would be confused about it. Raymarine displays only work with Raymarine radars, Garmin displays only work with Garmin radars, etc. And not even all radars of a single brand work with all its displays as there have been plug and interface changes over the years.